_____ Over the Rainbow (also known as "Somewhere Over the Rainbow") is one of the most recognisable and beloved movie songs in the world, made popular by Judy Garland who was the original singer when she performed as Dorothy in the 1939 classic movie, The Wizard of Oz. The song is about hope and a mystical world beyond everyday life. Even though it's an old song from over 70 years ago that was written by Harold Arlen specifically for Judy Garland to sing in the movie, the song has had numerous versions sung by other artists over the years. However, Judy Garland's sweet and powerful singing voice remains the best of the rest. 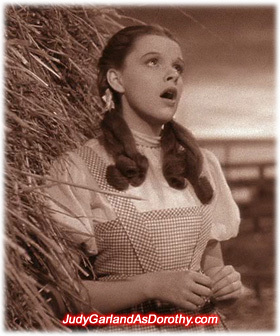 "Over the Rainbow" won an Oscar in 1940 for Best Original Song, and has since been recognised as Judy Garland's signature song, and became her best-selling single record. Louis B. Mayer, MGM studio boss and one of the most powerful man in the history of motion pictures, nearly made the biggest mistake of his life when he deleted "Over the Rainbow" from The Wizard of Oz following a preview. He said it slowed down the movie, and "Our star sings it in a barnyard." Fortunately, he was talked back from the edge, and this song earned the honor as the #1 "Song of the Century" in a list compiled by the National Endowment for the Arts and the Recording Industry Association of America. The American Film Institute also named it the greatest movie song of all time.